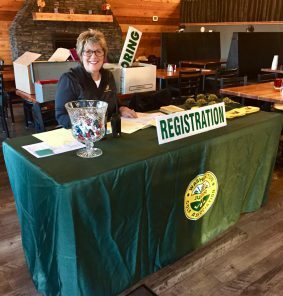 Jennifer von Doehren shines in her role at the Registration table. All Players must register as they arrive at the golf course. Information to cover and we know youre here! Suellen Hamm enjoys her role as starter on the #10 tee. Introductions, exchange scorecards and here we go! The Scoring Tent is a very critical area for making sure your scorecard and your fellow competitors scorecard are accurate and correct! We have the ultimately important things present – Pepsi and Red Vines! Boys 16-18 winners L to R; Grayson Giboney, Kevin Hollomon, Tyler Spalti, Victor Wang, Drew Warford, Blake Kukula, Ian Siebers, Daniel Tiscareno and Preston Bebich. WJGA Executive Director, Tyler Johnsen and State Rules Chair Paul Lucien putting up the WJGA flag in the early dawn hours! 208 players and WE DID IT! 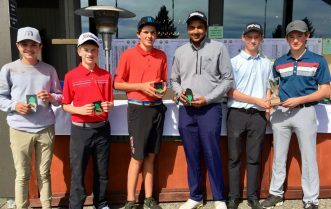 Boys 14-15 winners L to R; Hogan Warford, Owen Price, Burley Hildreth, Akshay Anand, Max Herendeen and Ben Borgida. 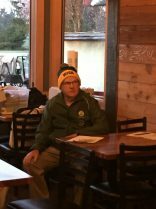 Steve McNelly and Zach at Capitol City were so very accommodating! We loved our two days in the sun! Boys 8-11 winners L to R; Zeke Prociw, Zach Huang, Teigen Brill and Floyd Villanueva. 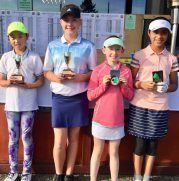 Girls 8-11 winners L to R; Angela Zhang, Tatum Otto, Kaitlin Ojendyk and Ananya Ray. 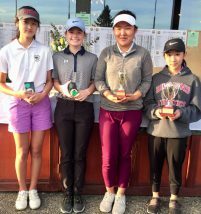 Girls 12-13 winners L to R; Kylie McGrath, Brianna Nguyen, Kiana Schroeder, Amber Li and Suzie Tran. WJGA’s driving engine are the dedicated volunteers that show up at each event unwaveringly! Shown here are a small portion of the statewide loyal Rules Officials that support our tournaments every year! Jim & Jennifer von Doehren – District Six Directors and Super Volunteers – enjoy a warming moment in the sun! St. Martins Mens team came by for a visit! 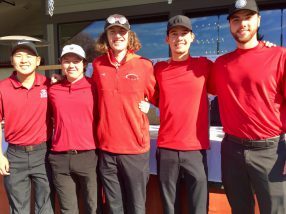 Jordan Terada, Max Turnquist, Tyler Fitchett, Dennis Geissler and Trevor Frisby. Girls 14-15 winners L to R: Grace Lee, Elizabeth Dolan, Angela Park and Nicole Kato! 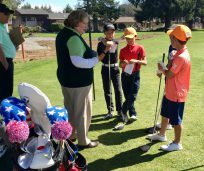 Practice Rounds – Available at standard junior rates. 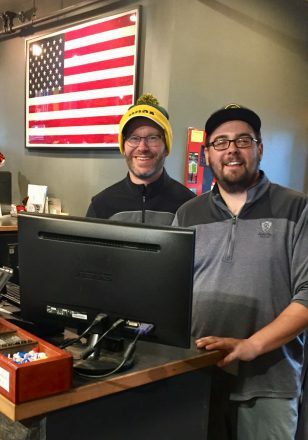 Please call golf shop at 360-491-5111 to schedule a time. Restaurant – The Fire Creek Grill will open at 6:30am each day. Tee Times – 7:30am-9:30am off holes #1 and #10, and 12:15pm-2:15pm of holes #1 and #10 both days. 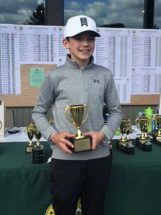 Max Herendeen wins the boys 12-13 division 70-76 (146)! 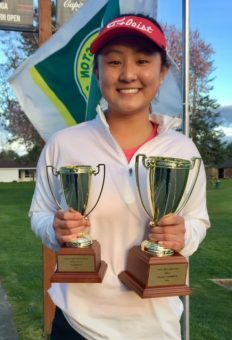 Brittny Kwon captures overall honors at the 2018 Western Open 72-69 (141)! Boys 16-18 winners, Jordan Lee, Sean Kato, Daniel Tiscareno, Drew Warford, Dennis Geissler, Ian Siebers, Colt Sherrell! 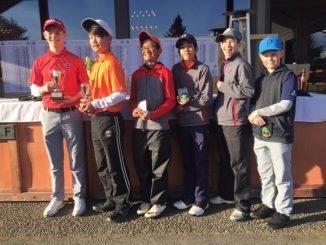 Boys 14-15 winners, Nate Plaster, Daniel Kim, Ethan Evans, Jahan Bains (missing), Luke Sherrell, Akshay Anand and Thomas Huang, Tommy Kimmel (missing)! 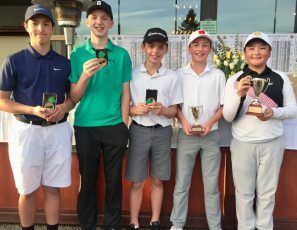 Boys 12-13 Winners Max Herendeen, Charis Lee, Eric Leonen, Giap Do, Isaac Elaimy and Colton Zehnder! 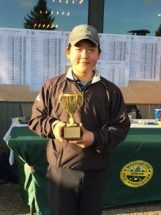 Boys 8-11 winners, Wilson Dicks, Daniel Martinez-Otto, Yijoon Seo, Taighan Chea, Floyd Villanueva and Eric Zhang! Girls 16-18 winners, Brittany Kwon, Alyssa Nguyen, Adithi Anand and Taylor Koch! Girls 14-15 winners, Claire Xu, Lauryn Nguyen, Gihoe Seo, Lily McCauley, Kennedy Knox and Angela Park! 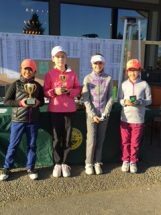 Girls 12-13 winners, Nicole Kato, Sanjana Chalasani, Suzanne Tran, Amber Li and Gigi Lund! 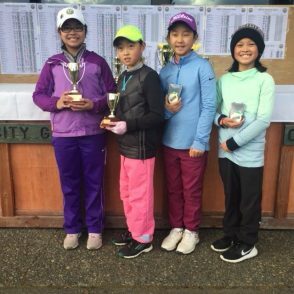 Amanda Nguyen, Angela Zhang, Audrey Park and Brianna Nguyen winners of girls 8-11 division! 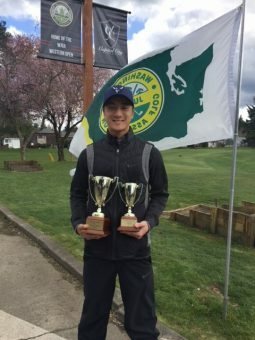 Wonjoon Seo and Cole Wicklander TIE with a two day total (9 hole) of 92!